Considering the Ricoh CX2 was only released back in August, it seems a little strange that the camera has been superseded so soon but it has, by the Ricoh CX3. Boasting the same 10.7x (28-300 mm) optical wide-angle zoom lens as its predecessor, most of the enhancements made by Ricoh for the CX3 come under the bonnet. These include an improved back-illuminated 10MP CMOS sensor and a HD mode which shoots at 1280 x 720 res, nearly twice that of the CX2. Looks-wise, you would be forgiven in thinking that you were staring at the CX2. 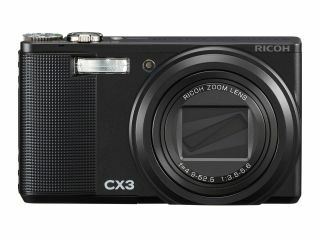 But, then again, ever since the CX1 arrived in February of last year Ricoh has kept the camera chassis looking pretty similar. Other functionality includes a Pets Mode for shooting pets (not that kind of 'shooting') and high & low luminance priority settings. The UK release date has officially been announced as "soon" with pricing fixed at the £299.99 mark. Go to www.ricoh.co.uk for more details.